Marion’s daughter once gave me a fridge magnet that says ‘Don’t treat me any differently than you would the Queen.’ It’s good advice, and last week Philip took it. We spent the weekend in a fabulous Tudor castle, in the very room where Henry VIII slept with his doomed wife Anne Boleyn. 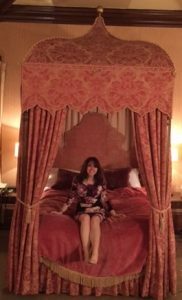 Encased within a sumptuous four poster bed, with a log fire roaring on the opposite side of the octagonal room, champagne sparkling in crystal goblets, truffles (quickly eaten) and a very large bouquet gracing the central table, it was easy to imagine we were royalty. My close friends know that I’ve had an interest in Anne Boleyn since early childhood, although Philip didn’t know that when he booked. It added another dimension to the weekend to know I slept in her room. I thought it was actually their bed, but apparently 500-year-old beds have bedbugs, so I’m guessing a luxury hotel chain purchased new ones at some point. This was a couple of days after a reception at the House of Lords to honour the finalists of this year’s Soldiering On Awards. The House, otherwise known as the Palace of Westminster, was built 1000 years ago. 1001 to be exact! The elaborate building we know stems from the mid-19th century, following a fire that destroyed the original palace. However, the medieval Great Hall survived intact, so it’s likely that both Anne and I walked through there. My MP arranged a wonderful tour a couple of years ago for the boys and me – until then we hadn’t realised that UK residents are entitled to visit free of charge, bypassing the £25.50 entrance fee. 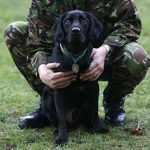 Two of the award categories are being voted for by members of the public – a People’s Choice Award that showcases some truly amazing people, and an Animal Partner Award for an exceptional animal that has carried out duties to make the lives easier in some way for members of the military family. If you have a spare minute, please take a quick look and cast your vote for the one you most admire. Some of the courageous people being honoured at the House of Lords may not have chosen to be ‘heroes’ but deserve the recognition nonetheless. We can all fly, whether we’re the eagle or the driving wind; we just sometimes need to be reminded to spread our wings a little wider than normal and remember that the future’s what we make it. Then trust ourselves to make it a good one. 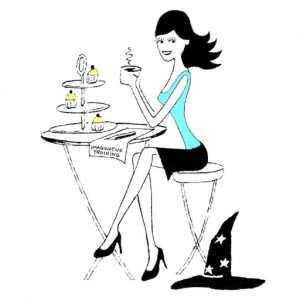 If you’d like to know more about the Soldiering On Awards, drop me an email – or ask me here: @WeekendWitch.